Newsflash: I love snacks, and, particularly, popcorn! Oh, I guess that isn't news, given how many times I have reviewed different popcorn. But I have a problem. The pastry team at my office makes really good flavored popcorns for events, so packaged, mass produced, popcorn rarely actually pleases me. Until now. 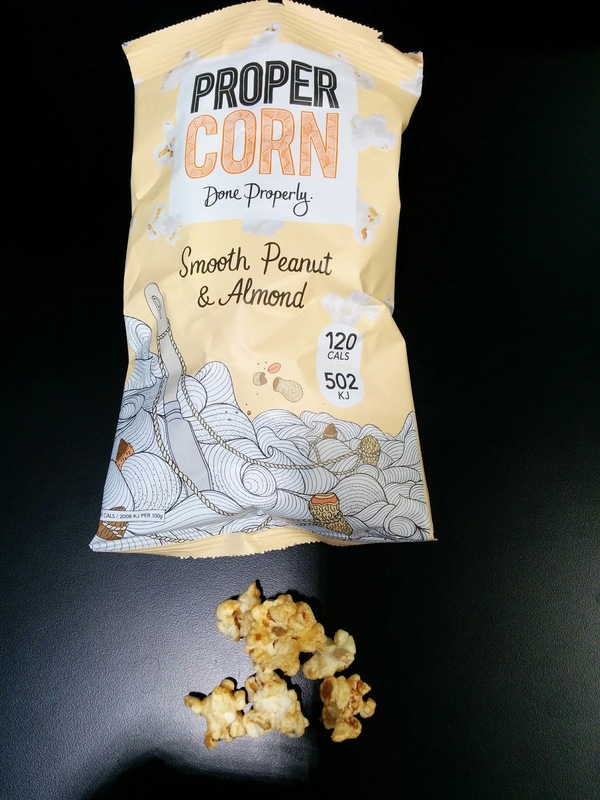 Proper Corn is a UK based company, that is discovered while visiting my office in London. They make 6 varieties of popcorn, ranging from basic "Lightly Sea Salted" and "Sweet & Salty", to far more exciting flavors like "Sour Cream & Black Pepper", "Fiery Worcester Sauce & Sun-Dried Tomato", and sweet options like "Sweet Caramel & Vanilla". I tried all but the basic salted variety. I was impressed with the popcorn. It was all fresh tasting, even though packaged. But more important, they managed to make flavorful, enjoyable popcorn that isn't crazy unhealthy. I'll be honest, I usually opt for very decadent homemade caramel corn or chocolate drizzled, and find that most packaged popcorn is just way too plain for me, even when they try to make flavors I like. Here, the kernels were well coated, there was abundant flavor, but it was not heavy. I could devour servings of the size I wanted without feeling awful after. I'll definitely seek out Proper Corn again ... next time I'm in Europe. 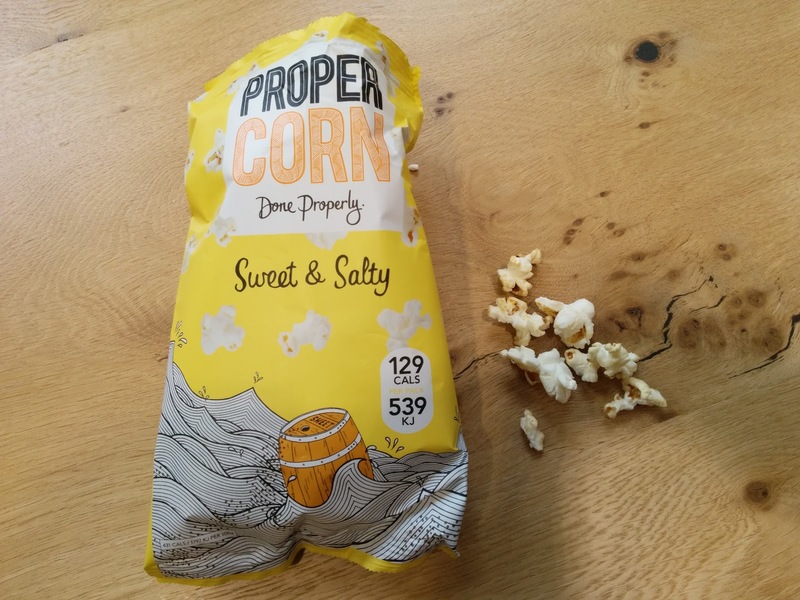 Proper Corn makes 3 varieties of sweet popcorn, and I tried them all. They were good, but, I ended up liking the savories even more. "Hand-popped corn with the perfect balance of sea salt and sweet brown sugar." I started with one of my favorite types of popcorn, kettle corn, or "Sweet & Salty" as they called it. It was pretty excellent popcorn. Light, fresh tasting, airy kernels, very well coated in both sugar and salt. I'm pretty particular about my kettle corn, and this delivered, particularly in the salt department. I wish I had it at home so I could try it frozen and crispy, which is how I really like my kettle corn. "Hand-popped corn, mixed with a smooth blend of peanut and almond." This was again good popcorn, well popped, and very well coated in toppings. The peanut and almond was a bit strange though. I thought that there was going to be chunks of candied nuts or something, like cracker jacks, but, actually, the kernels were coated in a peanut almond powder. 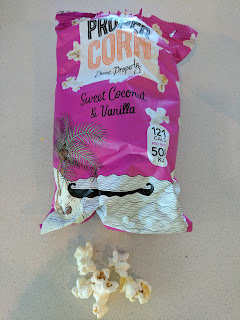 Super interesting, and I like those flavors, but it was a bit strange to have on my popcorn. 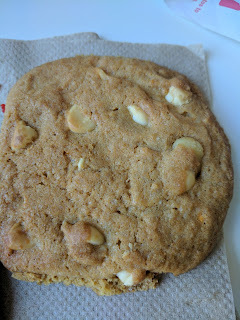 It also tasted more like almond butter than peanut, and, I'm less of a fan of almond. It was fascinating and enjoyable enough, but, not quite the flavor for me. Update: I had another bag a few days later. With my expectations reset to being nut butter coated popcorn, I enjoyed it much more. I actually do love peanut butter, and have a favorite Chex mix recipe I love with peanut butter coating, and this reminded me a bit of that, except a bit lighter, as the popcorn is a lighter base than Chex. I'd gladly eat more and more of this, and wished we had it stocked in my office. Also, I really wanted to put it in my freezer, as I love freezing popcorn, and I think the nut butters would freeze very nicely. Nit: This bag was a bit deceptive, as it looked pretty big, but was only filled about 1/3 full. 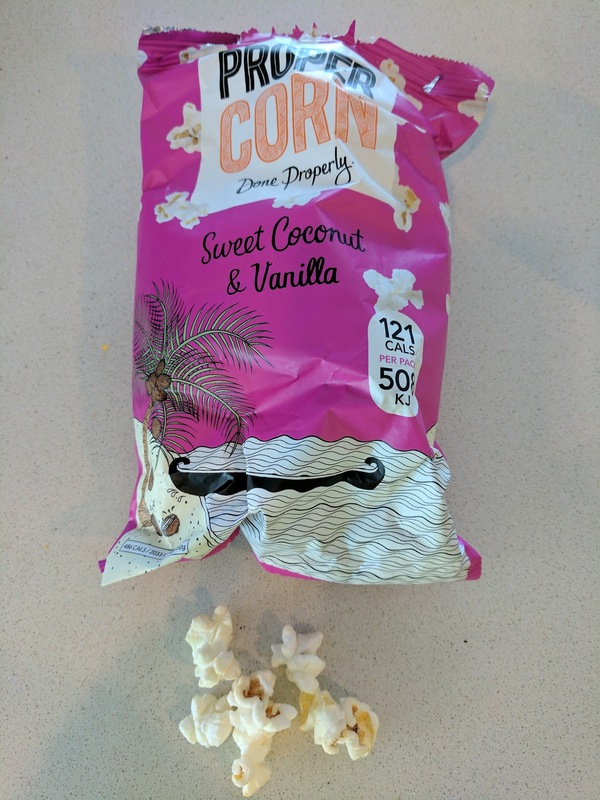 "Hand-popped corn sprinkled with a fresh blend of coconut and Madagascan vanilla." Finally, the third sweet variety, Sweet Coconut & Vanilla. This was another fresh, light popcorn. It had a slight sweetness to it, and a subtle essence of coconut. I didn't really taste vanilla, but, the coconut was different and the sweetness was definitely there. Not dessert popcorn, but good for a slightly sweet snack. I moved on to savories, again, 3 varieties, although I didn't try the plain salted one. These were excellent. Firey Worcester Sauce and Sundried Tomato Popcorn. 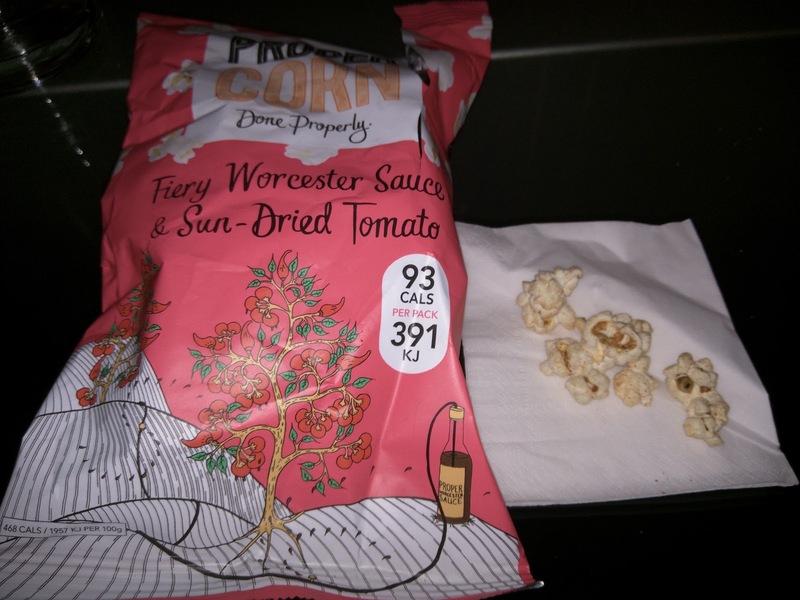 "Hand-popped corn, seasoned with our own Worcester sauce and a hint of fiery chilli." Well, this was pretty much amazing. Who would have thought that Worcester sauce and chilli would be good on popcorn? I guess it sorta had a hint of Chex mix flavors to it from the Worcester sauce, so, that makes sense. It certainly had a bit of kick from cayenne and pimento peppers, and some savoriness from onion, garlic, and sun-dried tomato, and some tang from vinegar and lemon juice, and then, the Worcester of course. So much flavor in the popcorn. The kernels were perfectly coated. I really enjoyed this, and devoured the bag faster than probably any other savory popcorn ever. Sour Cream & Black Pepper. 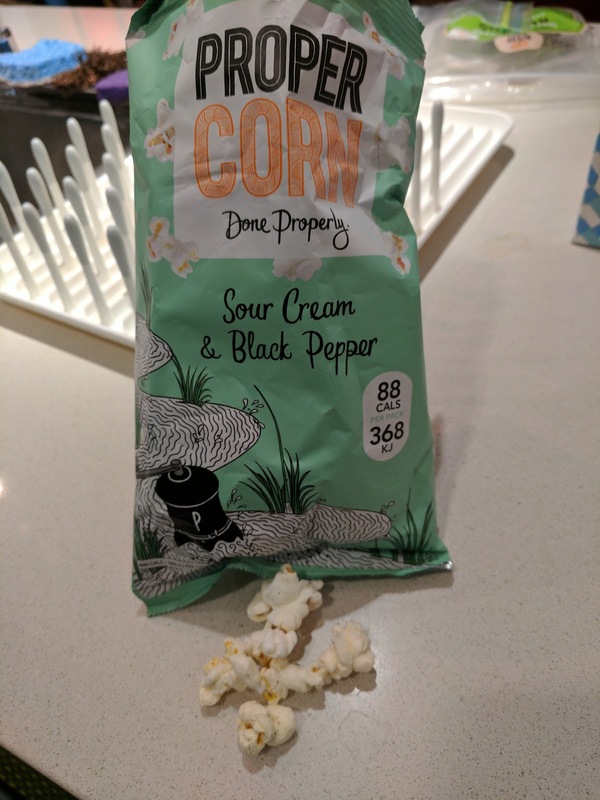 "Hand-popped corn, seasoned with a creamy blend of spring onions and cracked black pepper." This one was a bit odd at the first bite, as I tasted a buttery flavor that didn't combine with the other flavors, but, I never detected it again, and, the popcorn doesn't actually have butter in it, so I have no idea where that came from. Anyway. After that first bite, I loved this popcorn. It was savory, and reminded me of the sour cream and cheddar chips I used to eat as a child (even though it had no cheese in it, I sorta tasted a cheesy nature too ...), or, I guess sour cream and onion chips too. In addition to the sour cream and onion, the popcorn was coated with buttermilk and yogurt, giving even more tang. And then, the pepper. The pepper set this flavor apart from standard sour cream and onion, and it really amped up the flavor, without overshadowing the onion. A wonderful flavor, and I enjoyed it even (gasp!) without freezing it. I'd gladly get this again. I've reviewed standard Heartbrand ice cream several times before. But this is different. When I was in Lisbon, I found a froyo shop that I kinda fell in love with, called Weeel, for their crazy liquid "rafaweeel" and quality fruit toppings (stay tuned!). So a few days later, when Ojan and I were strolling through Cascais, I couldn't get ice cream, froyo, and other frozen treats out of my head, particularly when people kept walking by with cones in their hand. I needed some. Except, all we could find was gelato. I wanted soft serve, not hard serve. Frozen yogurt or ice cream, I didn't care which, but, I wanted soft serve. Shop after shop had images of frozen delights in cones, but all were hard style gelato. Gelato, gelato, everywhere. Eventually, the sun started going down, it got much colder, and I stopped wanting ice cream quite so much. And then I saw a sign. It showed soft serve ... Cornettos? I didn't understand, but, I was interested. 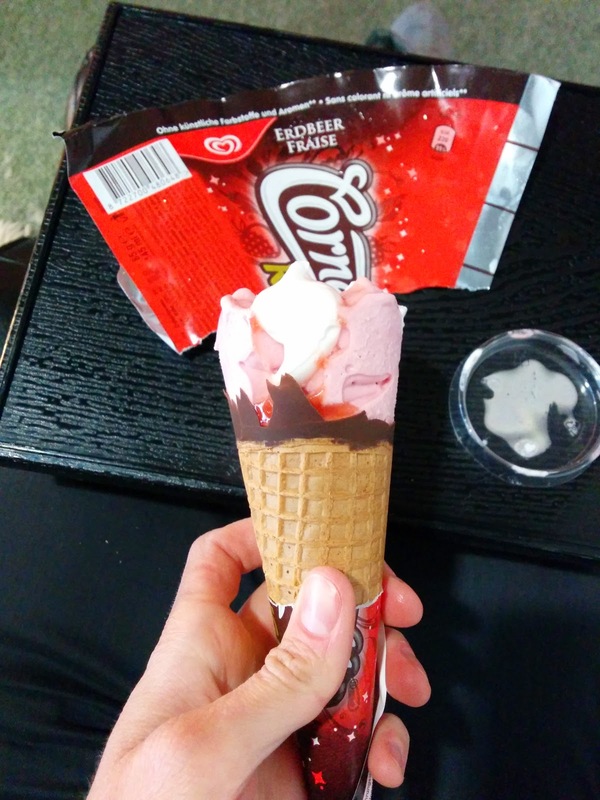 I thought Cornettos were just pre-packaged frozen desserts, that I've reviewed many times (in Australia and elsewhere in Europe). I had to go investigate further. 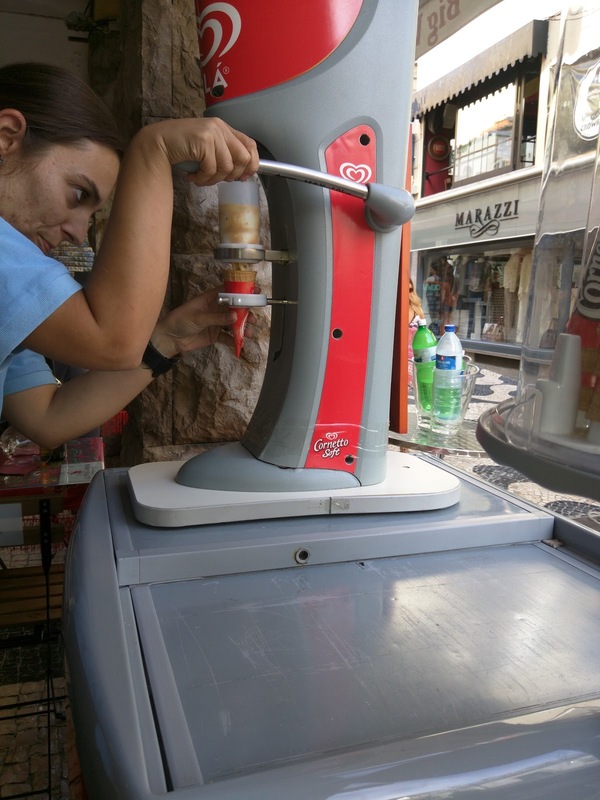 "The My Cornetto dispenser is so simple to use and maintain compared with commercial ice cream machines. Just plug in, insert your bottle and you’re ready to go!" When I approached, I didn't see a normal soft serve machine. I saw a plastic thing, that didn't even seem to take electricity, with a pile of cones nearby and a freezer. And then I saw other customers order ice cream. The store worker pulled out a plastic cartridge, put it into the machine, pulled the handle, and out came soft serve, directly into a cone. What??!! I found out later that the magic dispenser is called a "My Cornetto machine". 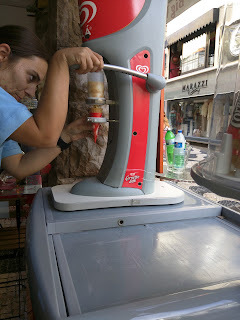 It is marketed as far easier to maintain than a traditional soft serve machine, and far more economical. It seems to exist in a handful of countries, including Australia and New Zealand. The cartridges look like push pops, and are frozen in a regular freezer, and just pulled out when someone orders an ice cream. So, still just packaged ice cream. I quickly stepped up and ordered the caramel one. When it was ready, the cone was handed over, as was the cartridge. The server demonstrated that I should lick the remaining ice cream out of it. No problem, I'm totally the girl who is always in the kitchen licking every spoon, bowl, beater! Sure, what I was given didn't look like the photos, as the top didn't have a nice peak. And, well, it clearly wasn't "real" soft serve, instead, it was ice cream extruded through a machine. But it *was* fairly soft. 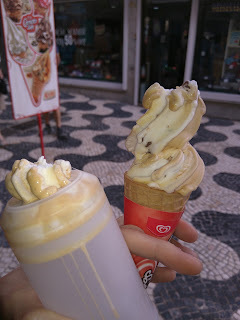 It seemed to have vanilla ice cream and caramel ice cream swirled together, and maybe some caramel sauce too? And chocolate coated crispy things and caramel coated crispies? I'm really not sure. I liked it, partially out of novelty. The caramel was very sweet however, so, I did need to take little breaks while eating it to not get a sweet overload. I loved the crunchy things, whatever they were. They kept me addicted, just like cookie dough bits in a pint, that you want to just keep digging for another one. Certainly an interesting experience, better than just getting a pre-packaged ice cream at a convenience store, and I'd do it again, likely trying another flavor. Another year, more travels to European offices with ice cream freezers, and thus, more chances to try Heartbrand ice cream. As always, I suggest you start with my original review, if you want more background. 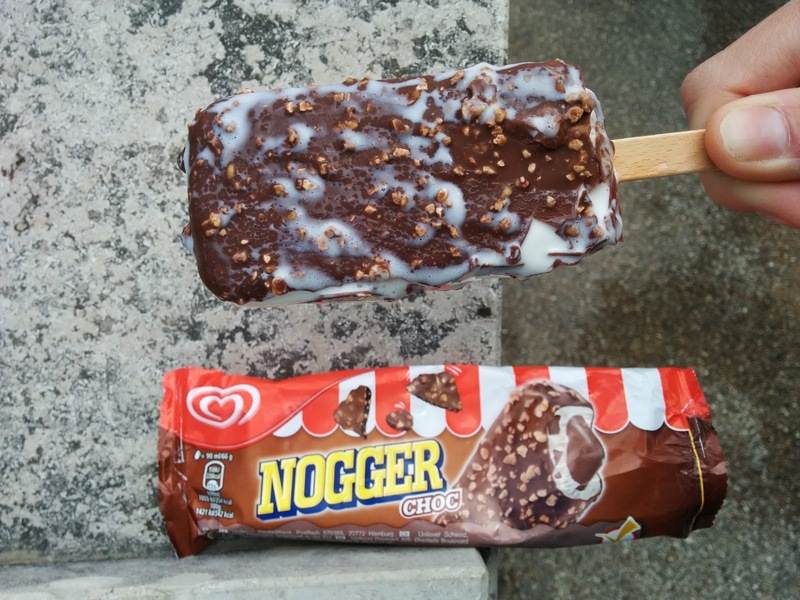 In our Munich office, they had many fantastic ice cream selections so it took me a while to try the strangely named "Nogger" novelties, as they looked like kinda standard ice cream bars on sticks. It turns out, the Nogger is the best selling ice cream novelty in Germany, and has been around since 1964. 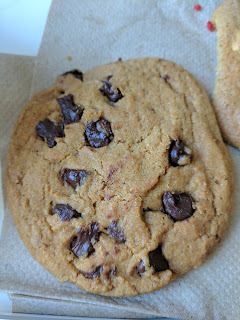 But finally, I did try it, both the regular and the "choc" versions. What is a Nogger? My understanding is that the name "Nogger" comes from "nougat" a key component of the bars. At one time there was also a "Nogger Black", with a black licorice coating (which sounds pretty interesting to me), but it turned into a racial controversy and was removed from the market. Ok, so I let this one get a bit too melty. That aside, this was a very good ice cream! The center was "Nugatkremfüllung", er, nougat cream. Basically, it was like nutella, in a slightly thicker form, still quite soft though. It was crazy delicious. Surrounding that was decent vanilla ice cream, needed to balance out all the chocolate and nut flavors. The shell was milk chocolate studded with crunchy "weißen Nugat" (white nougat) and "Zwiebackstückchen" (biscuit pieces). The shell had a nice snap to it. Overall, every element of this bar was pretty good on its own, but it really combined together nicely. Almost-liquid nutella-like center, creamy ice cream, crunchy, snappy shell? Awesome. I'd gladly get another. After the success of the Nogger Choc, I tried the original Nogger. It wasn't nearly as good. The milk chocolate shell with bits of nougat was still good, the vanilla ice cream was still good, but, I didn't care for the center. It was just ... chocolate ice cream, not particularly creamy. Meh. Stick with the Nogger Choc. I've had many Magnum bars in various locations, mostly in Sydney where they are sold under the Streets brand, but also a few last time I was in Germany. None have been remarkable, but they are a solid choice, and I enjoy trying new flavors. 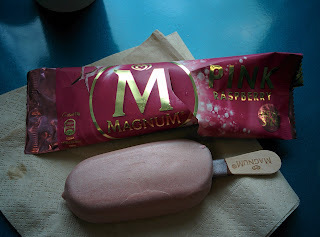 "Raspberry Ice cream with raspberry sauce, coated in milk chocolate, and an outer pink coating." Well, meh. This as pretty, but, that is about it. The shell was a thick milk chocolate, coated in shiny pink. It was really quite lovely, but, a lot of chocolate for the size of the bar. The ice cream was raspberry flavored, very raspberry, kinda tart. It was decently creamy, but I didn't care for the flavor. As I mentioned last week, I was recently on a business trip in Zurich, where my office had ice cream freezers seemingly everywhere, always fully stocked. As you can imagine, I ate a lot of ice cream in my few days there. It was there that I discovered Mövenpick, probably the best commercially prepared ice cream I've had. But I also got to try a slew of novelty ice creams by Heartbrand. Unilever is a ridiculously huge company (the 3rd largest consumer goods company in the world actually), comprising 400+ brands, a slew of which are ice cream related. They are the world's largest ice cream manufacturer. They tend to make mostly the same treats in every country, just with different names for the products, and even for the product lines themselves. You know them in the US as Good Humor. They even own Ben & Jerry's. In Zurich, they sell under the Heartbrand name, which is what I got to enjoy on my trip. When I first tried these, they reminded me so much of a treat I discovered when I was living in Sydney: the Pine-Lime Splice. I adored these things. Creamy vanilla ice cream inside, fruity lime ice outside. On a hot day, there was nothing like standing outside in the sun, a pine-lime splice in hand, with the icy outer shell getting just soft enough to almost drip down your arm, the ice cream getting perfectly melty ... oh, I loved them so. First, Heartbrand is Unilever's largest ice cream line. And, turns out, one of the slew of companies that Unilever owns is ... Streets! And in Australia only, they sell Splices. 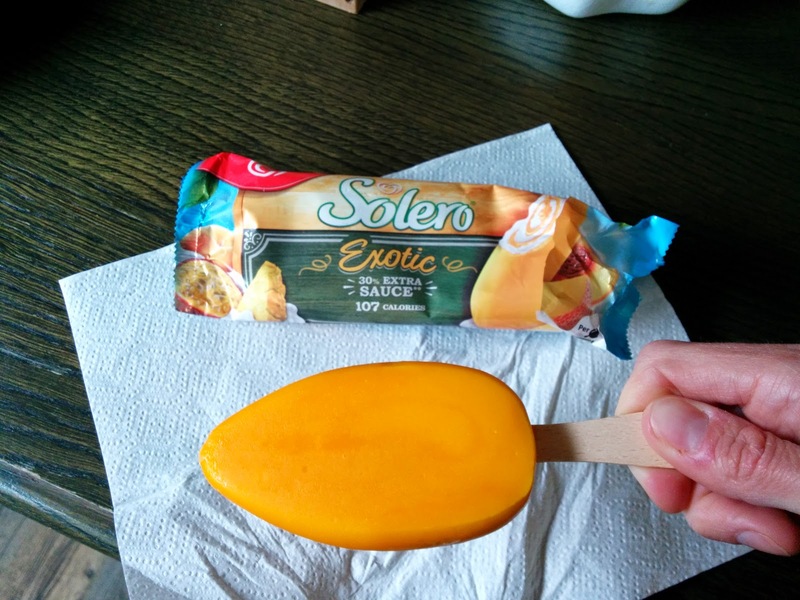 In other countries, they sell Solero bars. Same concept, although in totally different flavors. Well, no wonder these reminded me of my precious Splices! 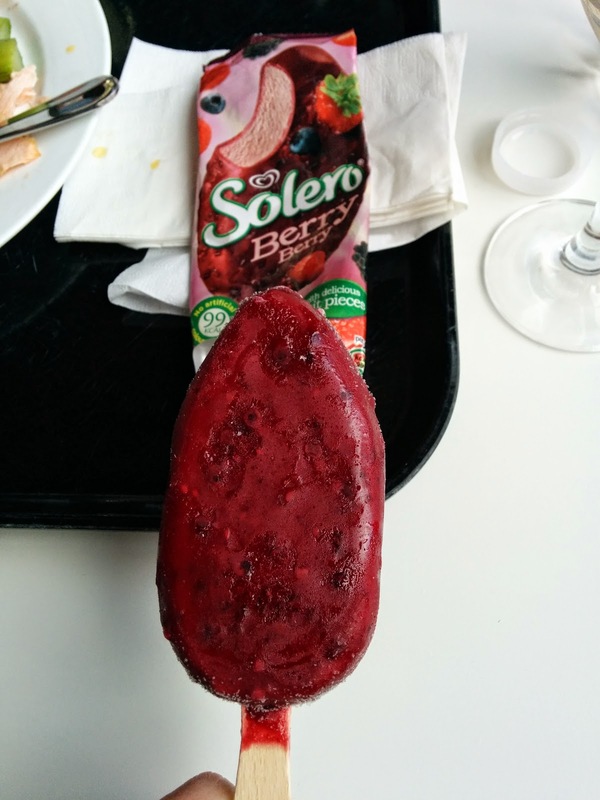 "With delicious mango and pineapple pieces, Solero Exotic really is the perfect treat to cool you down in the summer sun"
Just like a Splice, the inside was creamy vanilla ice cream, with a icy "exotic" slush outside. The slush had a nice mango-y flavor, and I do like the combination of vanilla ice cream and mango slush, but, this was just too sweet. It appears that Solero bars also have a swirl of sweet sauce inside the ice cream. The wrapper bragged that it had 30% more sauce. More than what? I guess it used to have less? Perhaps I would have preferred the old version, as this was just way too sweet for me, and I have a sweet tooth. Even the creamy vanilla ice cream inside couldn't cut the sweet. Without the extra sauce inside, I might have liked it. "A fruit-lover’s dream. Indulge in the smooth centre and gorgeous fruit sorbet coating with delicious real fruit pieces". The ice cream, or sortbet I guess, inside was incredibly creamy. Nice berry flavor. I don't understand how they can make it so creamy without adding tons of fat. The quality of the ice cream/sorbet inside is much higher than most novelty ice creams in the US. I loved the way both layers melted, the ice cream getting even creamier, the icy coating getting soft. 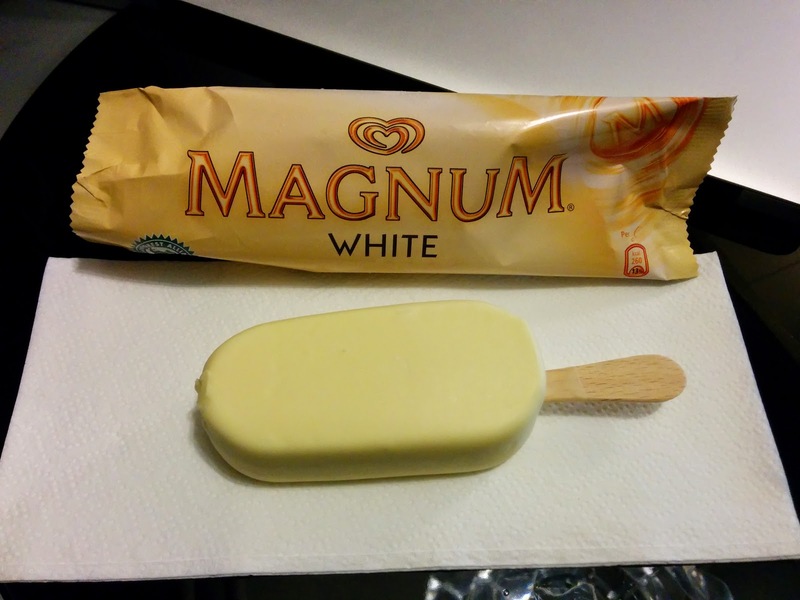 The outside was refreshing, like a popsicle, but balanced nicely by the creamy inside. This one really reminded me of a Splice, and, although I still prefer a Pine-lime Splice, I enjoyed this quite a bit. Cornetto is Heartbrand's line of ice cream cones. 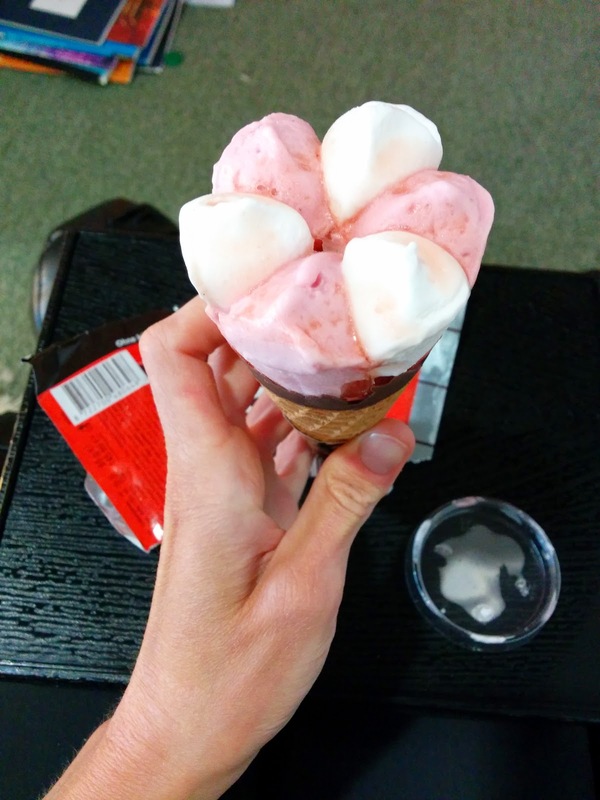 Unlike Drumsticks by Nestlé, the cones actually stay crispy and don't get soggy, but, just like Drumsticks, they are made with ice cream that fails to impress. "Cheesecake ice cream and strawberry ice cream with a core of raspberry sauce with muffin and chocolate chips". This sounded amazing: "cheesecake glory"! How could you go wrong with that. Plus, the packaging was much nicer than the packaged ice cream cones we get here, as it had a clear top, so you could see all the goodies on top. Sadly, it looked, and sounded, much better than it was. 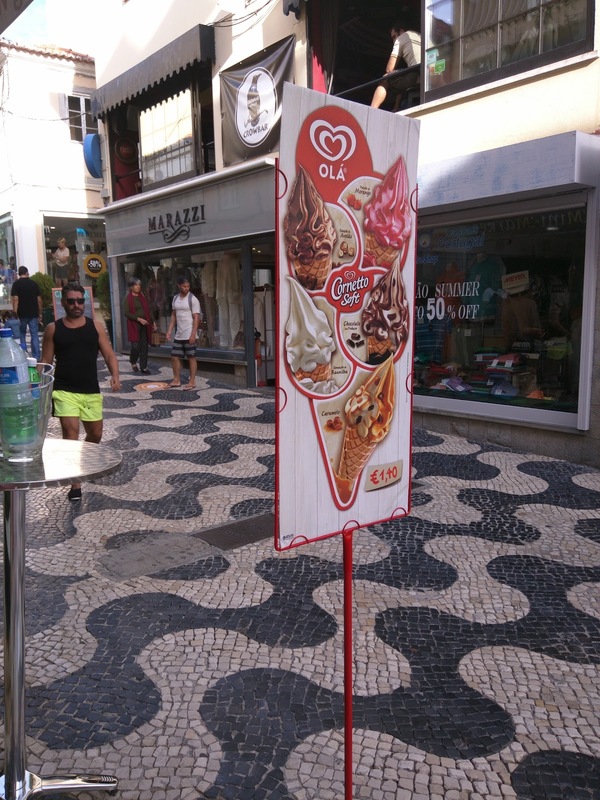 The ice cream inside, both the cheesecake and strawberry flavors, were very low quality. They weren't remotely creamy. The raspberry sauce was a fun touch, but, was just too sweet. And the "muffin" bits on top were soggy and off-putting. Also, why were there muffin pieces on a cheesecake creation? Shouldn't they have at least been graham cracker crust bits or something? 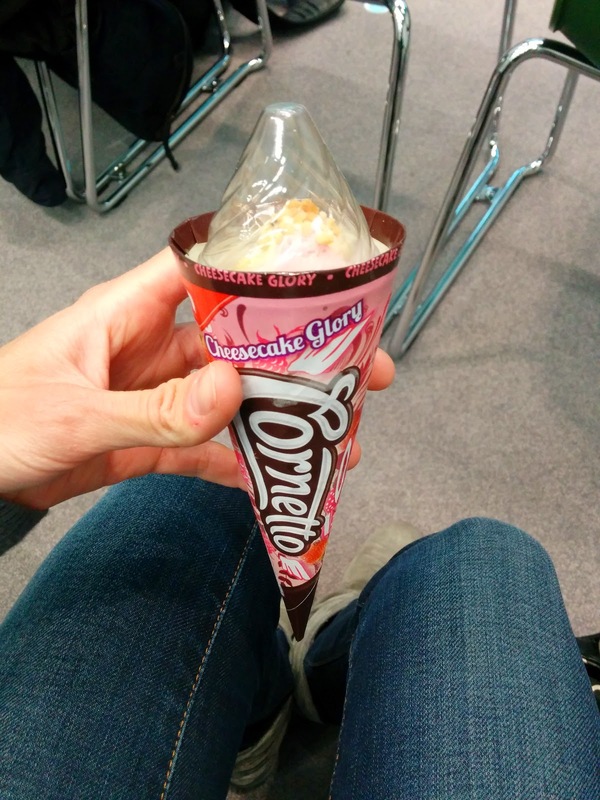 The only redeeming part of this item is that the cone somehow did magically stay crisp, and didn't get soggy. I didn't even bother finish this. "Ice cream with vanilla and strawberry sorbet with strawberry sauce, waffle and chocolate glaze. " The packaging was all in Swiss, so I had no idea what I was getting. Reading my notes was rather funny, once I looked it up online and found out what I had instead. I thought the vanilla ice cream was "supposed to be whipped cream", although I noted that it was more like vanilla ice cream than whipped cream. The strawberry sorbet I correctly identified as sorbet, not ice cream, but I thought it was raspberry. It was very icy and not smooth. Like the other cone, the only really good part about this was the cone itself, it somehow stayed crispy. And, the chocolate lining of course. But, still, I wouldn't get another. 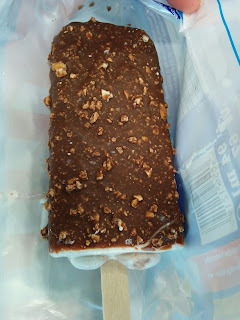 Magnum bars were introduced to the US in 2011, although I've never had one here. But when I was in Sydney, Magnum bars were everywhere, although, sold there under the Streets label (but still called Magnum bars). In Zurich, they are sold under the Heartbrand line. Magnums come in a slew of flavors. In Sydney, I tried all the standard ones, generally chocolate coated. "Rich vanilla ice cream, smothered in sweet, decadent white chocolate." This was a fairly standard offering, although, like most Unilever products, it seemed a step above the confections we get in the US. The ice cream inside was vanilla, it even seemed to have little bits of vanilla bean. It wasn't amazing, but it was pretty good. The coating was thick, and very creamy, sweet white chocolate. White chocolate has a bad reputation, but sometimes you just want something sweet, and this fit the bill. I don't really see a reason to get another one of these, but I happily finished it. 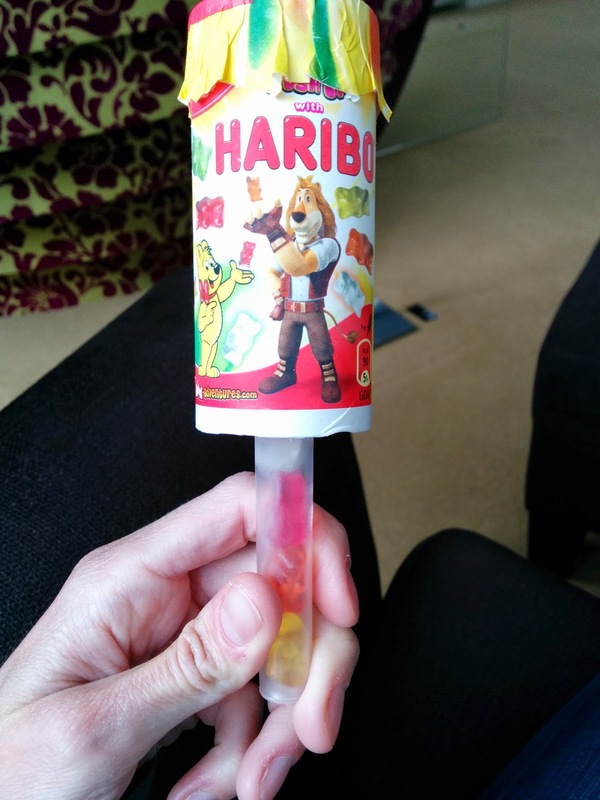 "Creamy ice cream with vanilla flavor and fruity strawberry sauce with a very special feature: Haribo Gold Bears in the solid stem." Ok, I admit it, I got this one just for fun. I had zero expectations for it. But, it had GUMMY BEARS in the stem! Sure, I dislike Haribo gummy bears in the first place, but come on, how could I not try this? It was the worst of all the products I tried. The ice cream was super low quality, not at all creamy, very icy. The "fruity strawberry sauce" was just sweet. And, you couldn't even access the gummy bears until you ate all the crappy ice cream. Serious meh! Several years ago, I wrote about a brand new Mediterranean place in town, Souvla. I didn't visit the restaurant itself then, but had their wrap at a catered event, and really enjoyed it. 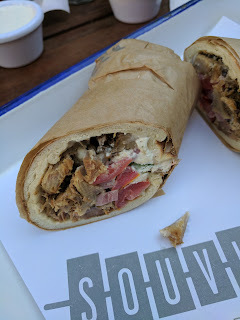 And then somehow I forgot about Souvla, until recently, when I was looking for a casual, fairly healthy, option for a Saturday afternoon lunch. Since my original review, Souvla has prospered. 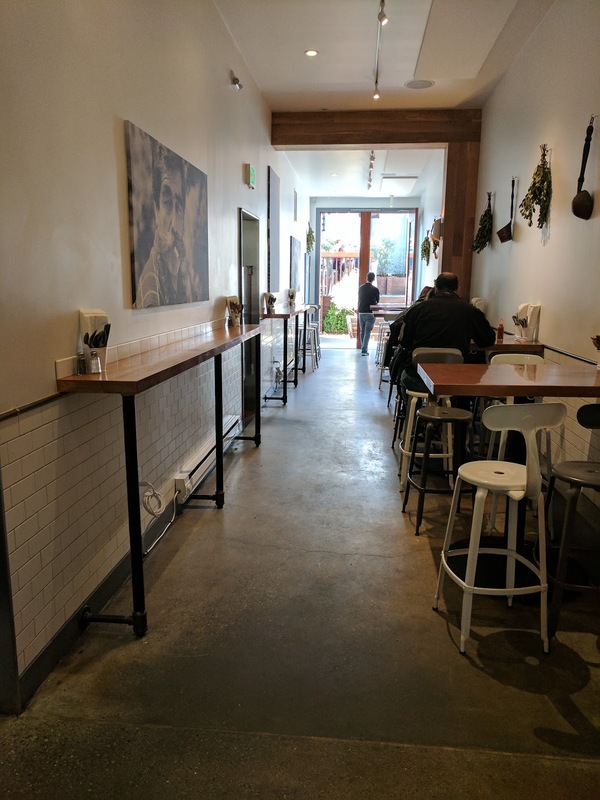 Their original Hayes Valley location lead to another, bigger location in Nopa, and, more recently, a third outpost in the Mission. 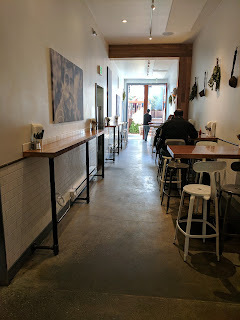 For this visit, a group of 4 of us went to the Nopa location, as we were more hopeful that we'd find seating there than in Hayes Valley. Overall, we had an ok meal. I do like that Souvla is basically a healthier version of things I usually enjoy, aka, I normally slather my fries in aioli, there I slather them in Greek yogurt. I love ice cream sundaes, there I have frozen Greek yogurt. But, overall, it was fairly lackluster for me. I really enjoyed my fries and dipping sauce, but, besides that, nothing was particularly worth going back for. Souvla is a fast-casual restaurant. 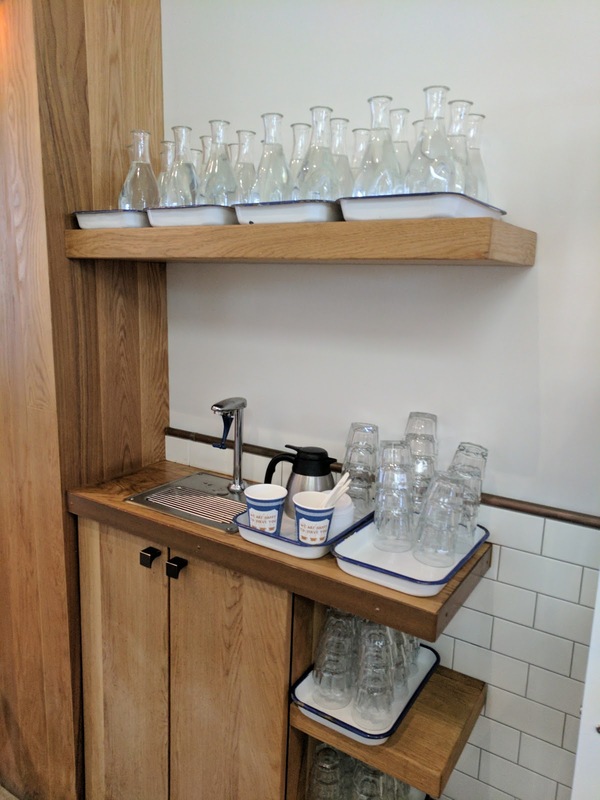 You order at a register, receive your beverages and a number, and the food is delivered to your table. Food came very fast, within 5 minutes. 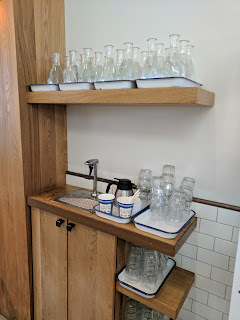 Past the register is a self-serve tap with water glasses and carafes. Not sure if it was filtered, probably? The front room has a few tables, a counter, and, the spit in action. You have to walk through here to get to the ordering area. Past the order area is the rest of the indoor seating, a very narrow space with small tables along the side, and more counters. They seem to do a very large takeout business, but it seems like it would get packed and cramped very quickly inside. 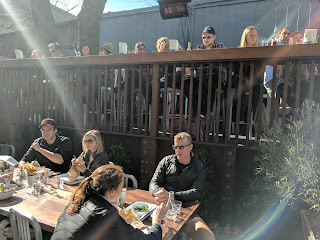 I was thrilled to discover the backyard garden seating, located at the rear of the restaurant. You walk all the way through the restaurant, to exit into this oasis. Sunny, completely isolated, no street noise. And, most importantly, since it is San Francisco, and even a beautiful sunny day is still a bit too cold to be comfortable outside: heat lamps. This area had a big communal table, plus a few smaller tables and counter seats. The menu at Souvla is small. For entrees, you can have a sandwich or a salad, in four varieties: pork, chicken, lamb, or veggie (sweet potato). For sides, there are also only 4 choices: salad, soup, 2 types of potatoes. Dessert? 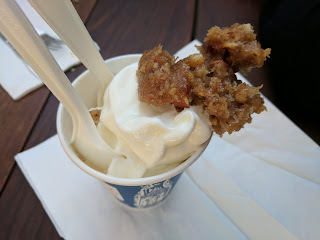 One item (Greek froyo! ), 4 flavors. So, a small, focused menu, but, the range is actually fairly wide, including great veggie options and lighter salads. Perhaps only pescatarians would be unhappy with the lack of seafood option? American Homestead Pork Shoulder Sandwich. $11. 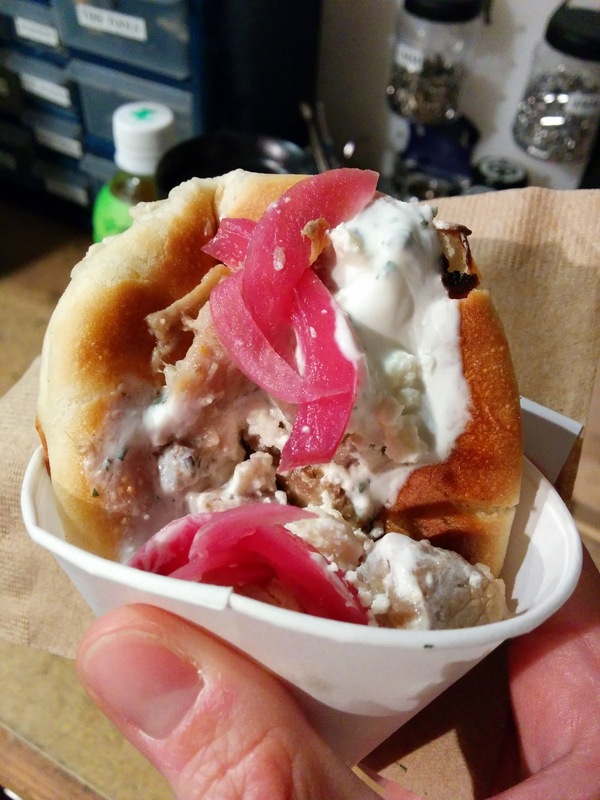 "American homestead pork shoulder with minted Greek yogurt, cherry tomato, pickled red onion, cucumber, and feta cheese wrapped in fresh and warm pita bread." For the entree, I had to choose between a wrap or salad. Now, both are not things I generally eat, but, I remembered how good the pita wrap was when I had it at an event, so I was pretty excited by the wrap. But everyone also raves about the salads, so those were tempting too, perhaps with pita on the side? In the end, I opted for a wrap. Then, choice of protein. Lamb was easily out side I hate lamb, but the chicken was quasi tempting because it comes with pea shoots, fennel, "Granch" sauce, and mizithra cheese, all of which sounded great, but ... I really don't like chicken, so I ruled it out. The veggie option, roasted white sweet potato, also sounded interesting, as it too had pea shoots and mizithra cheese (and toasted walnuts and garlic sauce), but, since I was splitting with Ojan, who wanted meat, I ruled that out. Which left the pork shoulder. I don't generally like pork (besides bacon and pork belly), but, I had some really, really good pork shoulder just a few days prior, so, I was actually excited about the idea of pork shoulder. Sadly, this one comes with feta cheese (instead of mizthra, and I'm not a huge fan of feta), and it comes with cherry tomatoes, cucumbers, and pickled red onion as the veggies (none of which sounded exciting), and the minted greek yogurt sauce (my least favorite), but, overall, it seemed like the best option. Side note: I wonder if I could mix and match ingredients to do something custom? Order the chicken one with pork instead? I didn't see any customizations really available, but perhaps they do it? Anyway. I didn't really like it. The pita was the part that made me the most sad. It wasn't warm. It tasted kinda stale and dry. Where was the magic pita I remembered? "Fresh and warm pita bread", it was not. Really disappointing. The pork shoulder was not juicy as I remembered either. It was also kinda dry and just didn't have any flavor. No crispy bits, no moist bits, just, boring chunks of pork. 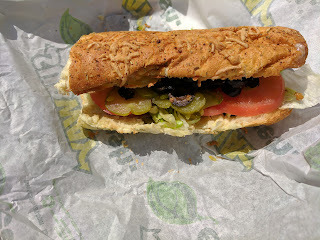 The feta/tomatoes/cucumber/red onions were fine I guess, but, again, not what I like. So, overall, very blah. Not flavorful, not fresh, not really tasty. Protip: if you are splitting, you can ask to have it cut in half, which they did (although they didn't bring two trays). "Crispy fries tossed in olive oil, lemon juice, herbs, and mizithra cheese." For sides, there is Greek salad (meh), avgolemono soup (double meh), "juicy potatoes" (Ojan had these before and said they weren't good, or "Greek Fries". So, Greek Fries it was. The fries were very good. They came in all different sizes, and I got quite a bit of joy whenever I'd find a crazy long one. 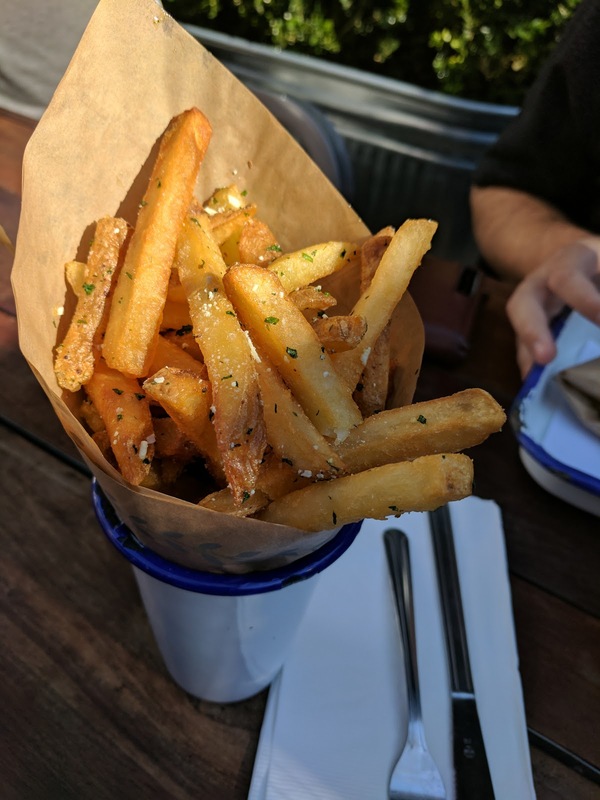 The fries were crispy and very flavorful, well seasoned with tons of herbs, plus the olive oil and lemon that I didn't distinctly taste, but, I'm sure helped amp up the flavor. My group ordered two baskets of the fries, and I only took a photo of the basket in front of me, but, you may notice something kinda lacking in this photo: the cheese. This batch really barely had any cheese, but the other batch was loaded with shredded mizirthra cheese. I really liked the cheese, and the inconsistency between the orders was striking. 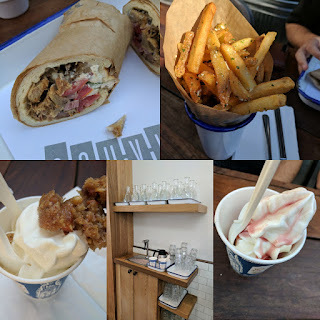 The fries (and dipping sauce) were the highlight of my meal, and I even went back and finished the cold fries rather than having more froyo. They were that flavorful and addicting. I'd gladly get these again. Mint, Garlic, and (not pictured) "Granch" Greek Yogurt. $1/each. 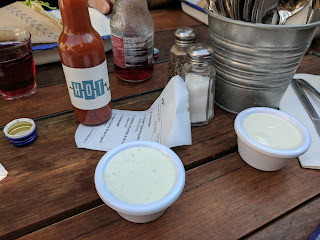 Souvla has no ketchup available, but for $1, you can add a dipping sauce for your fries, a little pot of any of the Greek yogurt based sauces that they use inside the sandwiches and on salads. Choices are mint, garlic, harissa, and "Granch", and we ordered all but the harissa. All were a much healthier option for dipping fries than my standard choice of aioli. I appreciated this, but was skeptical, as I don't tend to really like yogurt, and, well, I love aioli! I was pleasantly surprised. The mint variety (left) fell flat for me, but I LOVED the garlic one. Tons of flavor, and it complimented the herbs in the fries amazingly well. This was also Ojan's favorite. After we got dessert, I actually decided to polish of the remaining, now cold, fries and all the garlic yogurt, as I actually preferred this to the froyo. Yes, really. The "Granch" is the dip that was most recommended in reviews, and the one I ordered. It did not arrive with our food. I asked the person who brought our order, and he told me we could go order it if we wanted. I said I did order it. He again told me I had to pay and told me to go back to the register. I am certain I ordered it, and certain she repeated it back to me, so, I got more aggressive in asking for it. I didn't like arguing, but really, WTF? The "Granch" turned out to be my second favorite, a greek yogurt version of ranch, with lots of herbs and spices. It was fine, but, in my eyes, pales in comparison to the very flavorful garlic flavor. All flavors were not too tangy, and were a nice consistency for dipping, albeit a bit thick. I'd gladly get the garlic one again, and it was very worth my $1! The dessert menu contains only one item, but, it was really what I was there for: frozen greek yogurt. Only one size, only served in a cup, but with 4 toppings options: greek olive oil & sea salt, baklava crumbles & honey syrup, greek sour cherry syrup, and cretan wildflower honey. They have a good system where you can order dessert when you order everything else, and they give you a separate receipt for it. Then you just approach the register when you are ready, hand over the ticket, and get your froyo. I really appreciated this, as it meant we didn't need to get back in line and pay again, and we also didn't need to feel rushed to get to the melting froyo. 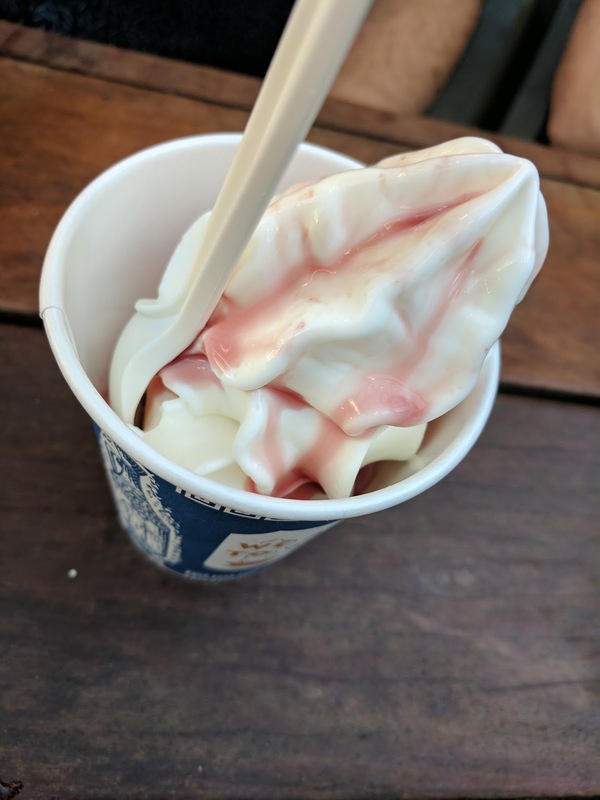 Frozen Greek Yogurt with Greek Sour Cherry Syrup. $4. One of my dining companions went for the Greek Sour Cherry Syrup, which I was tempted by, but decided against because "baklava crumbles" just sounded better. Texture! Plus, mine would have honey syrup too. Frozen Greek Yogurt with Baklava Crumbles & Honey Syrup. $5. My "baklava crumbles & honey syrup" let me down. The baklava crumbles were not crispy and didn't seem to include any filo dough. It was more a sticky paste of nuts and spices. Also, it was precariously perched on top, and nearly fell of as I walked back to the table. Ojan also did not like this, and only tried a single bite of the topping. The honey syrup seemed to not exist. Did they forget? Was it part of the paste, not a separate drizzle? Not sure, but since we didn't like the paste, we didn't have any topping to compliment the froyo. The froyo itself was very good however. It was tart, and healthy tasting, yet perfectly creamy. Usually healthier style froyo winds up icy, and that was not the case here. Both Ojan and I agreed that this reminded us of Yogorino, a European style frozen yogurt shop that existed in San Francisco for a short time. Anyway, I didn't really like this as much as I wanted. Yes, the yogurt was high quality, tart, and creamy, but my toppings let me down. Souvla is a fairly new Greek place in Hayes Valley. It follows a fast casual model, more like a neighborhood souvlaki joint like you would find in Greece. The menu is focused around a roasting spit (a "souvla"), offering spit roasted items (pork, chicken, lamb, and sweet potato for the vegetarians), served as wraps or salad bowls. There are only a few sides, including "greek fries", potatoes cooked in rotisserie drippings, and a classic Greek side salad. They also offer dessert: legit frozen greek yogurt, with really interesting topping options: sour cherry syrup, olive oil and sea salt, baklava crumbles and syrup, or wildflower honey. 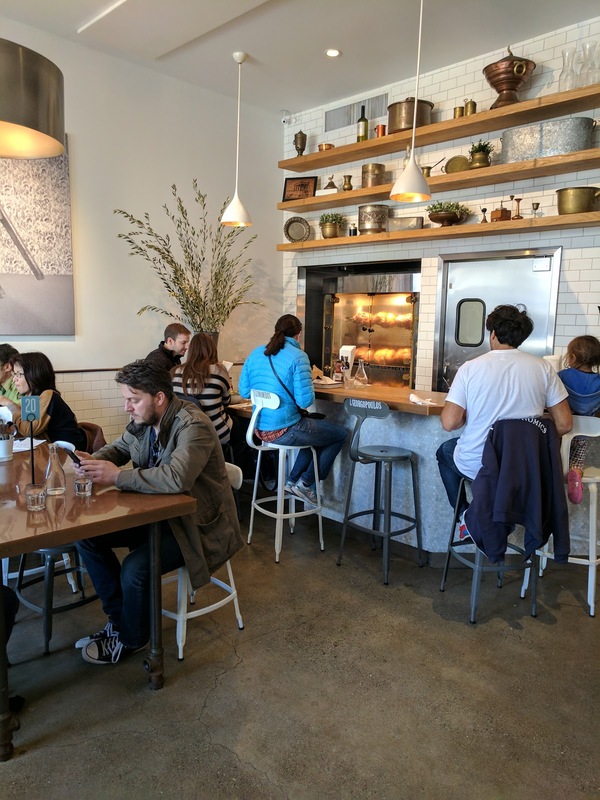 I've had my eye on Souvla since the doors first opened a few months ago, not because I like greek food, but because the chef worked under Thomas Keller at The French Laundry and Bouchon, and under Michael Mina at RN74. Even if greek isn't ever a goto cuisine for me, I can appreciate well prepared food of any type. And well prepared it is. I haven't actually been to Souvla yet, but I was at an event over the weekend where they were one of several caterers, so I got to try a few bites. It wasn't what I'd normally order, but it was delicious, and now I REALLY want to visit the restaurant. At the event, Souvla served a single item: mini pork souvlaki. Now, I'm not usually a sandwich person, nor do I really like pork shoulder, but ... I had wanted to try Souvla, and that is what they had to offer. The pork souvlaki is described as "American Homestead pork shoulder, minted Greek yogurt, cherry tomato, pickled red onion, feta cheese". I took my first bite of this, not really expecting to like it. I saw trying it more as a research project than something I was really intending to bring me happiness. But ... it turned out to be totally delicious. First, the pita bread. It was slightly crisp on the outside, yet beautifully fluffy inside. It had a subtle sweetness to it. Unlike any pita bread I've ever had before. It is made specifically for Souvla, but I wish it were available for purchase somewhere, as I really enjoyed it. Next, the pork. As I said, I don't normally like pork. Crispy bacon? Obviously. Some salami? Sure. But pork shoulder? I can't say I've ever actually liked it. But this was good, incredibly moist, tender, and flavorful. Speaking of flavorful ... the pickled red onions packed a punch. So much flavor there. As for other ingredients, I never found any cherry tomatoes in mine. The yogurt was tangy Greek yogurt, but I didn't taste any mint in it. The yogurt was nice for some creaminess, but I would have preferred it without. It is strange, I like yogurt, particularly with breakfast as part of a fruit/granola parfait, but I don't tend to like yogurt with my savory foods. Anyway, overall, this was quite tasty, and far tastier than I ever imagined it would be. It made me really excited to check out the real restaurant and perhaps order something more to my liking, although honestly, I would be temped to get this again, just without the yogurt. At the restaurant, this is available in a much larger size wrap for $10, or, as a salad bowl. Aki Boulanger, mediocre melon pan. Pierre Hermé, another famous bakery, where maybe I just got the wrong thing? Even chains like Paul have decent baguettes. A fascinating dessert degustation filled with really creative dishes, at Dessance. Definitely one of the most unique dining experiences I've had. Le Comptoir de la Gastronomie, Paris ... lots of foie gras, but not remarkable in any way. Pizza in Paris? Not particularly notable at East Mamma. Okinomiyaki in Paris? Yeah, also not great, from Aki Restaurant. Mars brand ice creams, generic. More ice cream novelties ... brand unknown. Breakfast Buffet at Restaurant Les Etoiles, Sheraton, Charles de Gaulle Airport. Not very good. Temporary executive lounge at the Sheraton CDG, also not very good. Dining on a train! Eurostar.